More and more people have embraced the concept of financial freedom, and are fast turning to Network Marketing as a model. Network Marketing in Nigeria has come of age, and loads of Nigerian MLM Leaders are springing up to spread the gospel, particular on Facebook, and other social media. 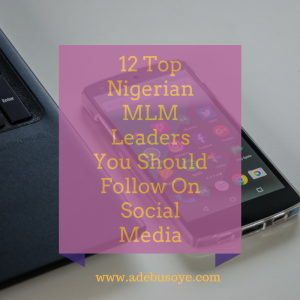 So, here are the top 12 Nigerian MLM leaders you should be following on social media. And of course, their leadership ability, Integrity, and love for people…because without this, you might have millions in your bank account but are still NOT a leader! This well-spoken and articulate man is an MLM veteran I respect so much. He’s a true ambassador of our profession and upholds the highest standards of integrity. He gives massive value, and represents Nigeria in MLM events worldwide like ANMP (Association of Network Marketing Professionals), and he is also a top earner in his MLM company. He is a mentor to ALL, irrespective of which company you are, and will not hesitate to lift you up if you’re down. 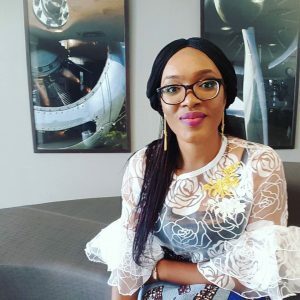 I first came across Kemisola when she was being profiled by Networking time’s magazine, the top publication in our industry. Since we’ve become friends, she’s blown me away with her focus, and her commitment to helping women become financially free. Her passion is to raise 1000 millionaire mommies. 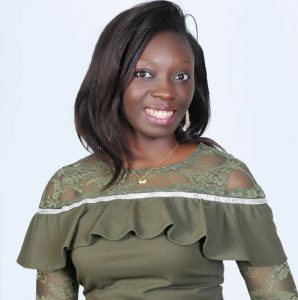 “Mama K” as she is fondly called is also a master digital marketer, who teaches her team how to recruit using social media and is a top earner in her MLM company. Her wall is always massively packed with value, and she is always willing to help irrespective of which company you’re with. 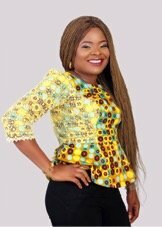 Lynda is a veteran in the Nigerian MLM space and an NLP practitioner. I’ve followed her progress over the years and her mastery of social media is one of the best I’ve seen in ages. Lynda is the founder of the Rookie 2 Rockstar academy where she shows Network marketers how to build a successful brand using Facebook, and attraction marketing. She’s has gotten coaching from industry leaders like Tanya Aliza who recently awarded her “Most Valuable Boss”. 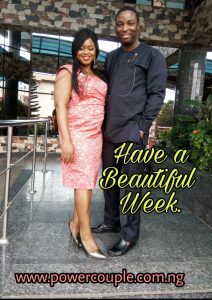 Fondly called the power couple, this couple has been super consistent in the Nigerian Network Marketing space. They both put out valuable content in the form of updates, and Facebook live videos and are serious ambassadors of Network Marketing and wealth creation. They are top leaders, and mentors and NLP practitioners. I’ve watched Sharon from afar. Her personal brand is amazing. Once you land on her personal profile, the value she puts out there in form of videos and posts will magnetize you, and you’d find it difficult to click away. She’s very passionate about defending Network Marketing and educating people about the fact that it’s not a get rich quick scheme. She’s a top earner and recently hit a top rank in her company. 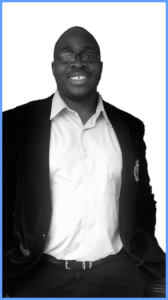 Adegboyega is a young under 30 top earner in his Network Marketing company. 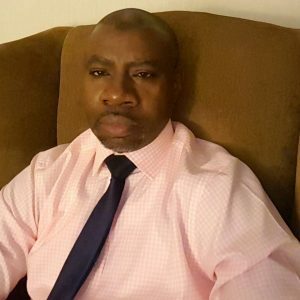 Apart from being a strong MLM leader, Adegboyega is also a seasoned Internet marketer, who is an expert at selling physical products online. I have been impressed with his progress, and even interviewed him here. 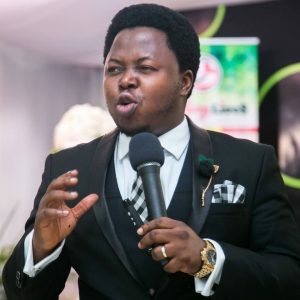 Gboyega has a strong personal brand and is on a quest to raise more young millionaires inside of Network Marketing. One thing I love about Ucheya is his street smart, and no BS method of passing across his knowledge. He puts out a serious amount of value on his page with the #usefthinkam hashtag, and is a strong proponent of ethics inside of Network Marketing. He’s an amazing leader and mentor to follow. 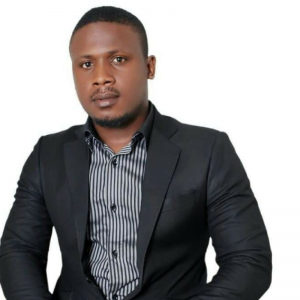 Popularly called “SDF baba”, Seun “Taddy” Duro-Fadipe is one guy who has cracked the Facebook algorithm for engagement. On a good day, Taddy’s posts get over a minimum of 100 likes. He posts on Network Marketing, wealth creation, and life in general, and gives powerful value on his Facebook profile. 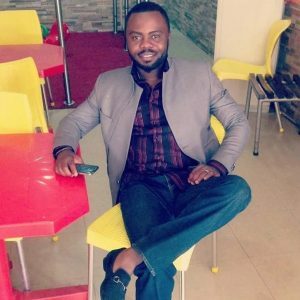 Adeolu Akinyemi is someone I have admired for years and is CEO of a Nigerian Network Marketing company. I first heard him speak in 2005 with Gbenga Sesan and I was seriously blown away. We both spoke on different days at the MLM exhibition 2016 event held in Port Harcourt, Nigeria. He’s not so active in the field now and has moved to more of personal development and wealth creation. He is a massive proponent of Robert Kiyosaki’s works and was one of the godfathers instrumental in raising the awareness of Nigerians to the possibilities inside of Network Marketing. He is an awesome speaker, mentor, and trainer, and is hands down, in my opinion, the BEST financial intelligence teacher in Nigeria. I stumbled into Network Marketing in 2008 through being a student of personal development and failed in different companies before I began to be serious in 2012. 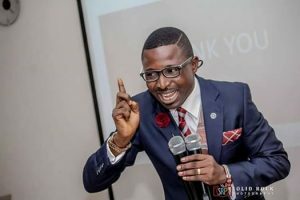 I started this blog (encouraged by Ray Higdon’s coaching) to spread the MLM message in Nigeria and Africa and last year this blog was ranked #18 in the Top MLM blogs worldwide. I’m a personal development junkie, and an NLP practitioner also. If you’d like to work with me in my primary MLM or join my coaching program, check out my work with me page. Raheem is an amazing leader, who has achieved what many people using social media for business find difficult…which is striking a balance between posting value consistently, and talking about their product and opportunity. Raheem’s followership spans Nigeria and other African countries, and he has succeeded in building a strong personal brand on social media. Dunni is a top earner in her Network Marketing company and has a very strong personal brand on Facebook. She is a powerful trainer and a very powerful inspiration to women out there. Boss D (as she’s fondly called) channels her bubbly personality in her Facebook live videos which gets loads of views. 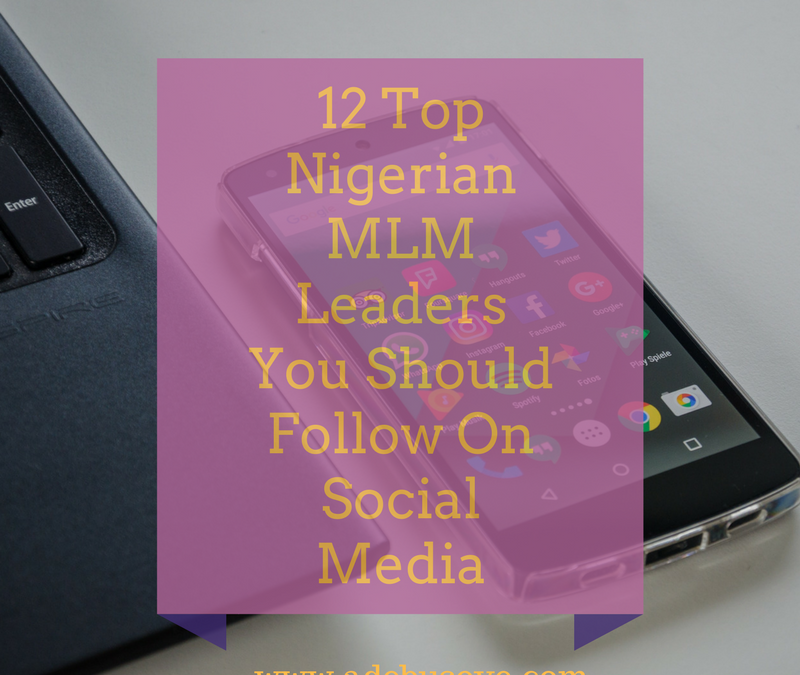 I hope you enjoyed my list of the top 12 Nigerian MLM Leaders to follow on social media. It was fun putting this together and very challenging, keeping it to 12 names, not to mention the research involved. But Its awesome our Nigerian MLM leaders get the recognition they deserve. So what do you think? Who on this list has helped you get better in Network Marketing? Whose name did I forget to include? Comment below, and I look forward to hearing from you! GOOD EVENING, your site is an eye-opener! hope to be on this great list someday, however I am a member of a new network which is a new company based in Malaysia and yet to kick start in Nigeria, our Ghana office was launch a few days ago and it was a great success, I am looking for a great motivator like you to learn from for a successful future in networking. Thank you. Thanks for the kind words Regina, and I wish you all the best in your business! 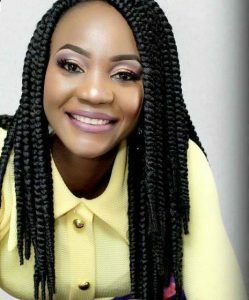 Thanks for educating us on the top Nigerian MLM leaders to follow.